When you place your foot on the brake pedal and press down, this force is transferred through fluid to the brakes on the wheels of you vehicle. Since it requires a much greater force to stop your vehicle than you can possibly apply, this force must be greatly increased. This is done through either hydraulics or friction. Applying pressure to the brake pedal engages the master cylinder that creates hydraulic pressure forcing brake fluid through lines to the brakes on the wheel. Pressurized brake fluid moves through brake lines made of steel and rubber hoses that are constructed to withstand great pressure. In order for your vehicle to stop pressure must be applied to friction materials through wheel cylinders and calipers. The most common brakes are friction brakes that use either drum brake shoes or disc brake pads made of materials that are designed to withstand very high temperatures. These brakes are usually a rotating device with a stationary pad and a wear surface that rotates. The master cylinder sends hydraulic pressure to the wheel cylinder through a hose forcing it to press the brake shoes up against the surface of the rotating brake drum which is connected to the wheel causing enough friction that allows the vehicle to slow down or stop. The wheels of the vehicle are attached to a cast iron or ceramic disc brake rotors that spin as the wheels spins. Disc brake pads are mounted inside of a device called a brake caliper piston whose function is to slow down the spinning of the wheel by clamping down on the disc brake pads creating friction on the disc brake rotors thereby slowing down the vehicle. The caliper is able to compress the disc brake pads because of pressurized hydraulic fluid that is sent from the master cylinder. The purpose of a parking brake is to prevent a vehicle from rolling when it is parked. This brake is most commonly a mechanical brake that applies friction to the rear brakes through cables attached to either a hand lever or small pedal. Additional security is provided if the vehicle has an automatic transmission which uses a lock in the form of a pawl that is engaged when the transmission is placed in the “park” position. 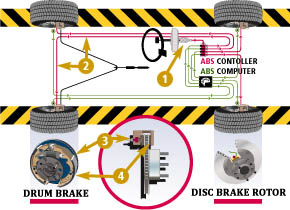 Since the late 1980's antilock braking systems have become a standard on more passenger vehicles. This system is computer controlled through sensors mounted on the wheels that input wheel rotation speed into a microprocessor in the onboard computer. When an event occurs like tire slippage, loss of traction or a sudden stop, the controlling unit notifies an electric or hydraulic modulator to regulate the pressure in the brake line to prevent the wheels from locking up. This system continues to work releasing and applying pressure as the wheels continue to roll while maintaining the driver's ability to operate the vehicle and stop in a shorter distance.